Heralded as "the greatest writer of our time" by philosopher Jean-Paul Sartre, John Dos Passos spent time in and out of Baltimore from his birth in 1896 and lived here from 1950 until his death in 1970. An acclaimed biographer and novelist, Dos Passos is best remembered for his experimental writing style, often emulating the techniques of the camera and the newsreel, particularly in his trilogy of novels, U.S.A. While Sartre called him "the greatest," Baltimoreans just called him "John." Dos Passos worked in the George Peabody Library as well as the Enoch Pratt Free Library and Johns Hopkins University Library almost daily during his time in Baltimore. 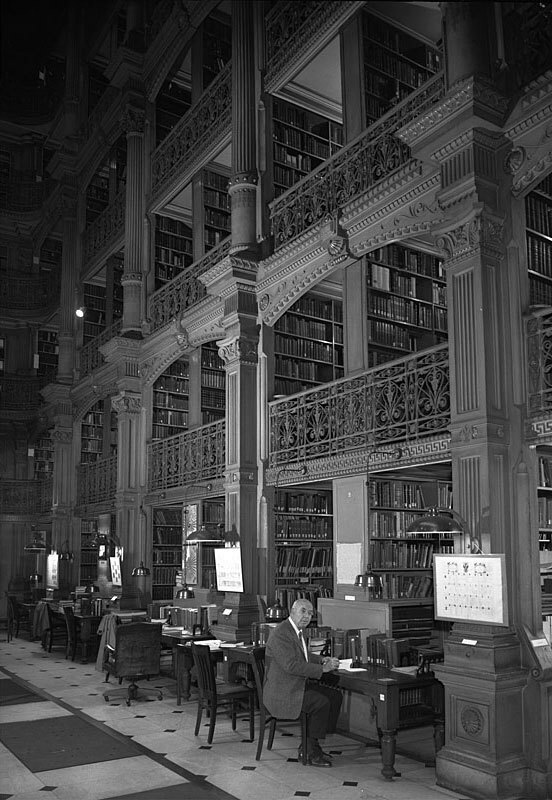 Although Dos Passos once described his ideal working conditions as only, "a room without any particular interruptions," the George Peabody Library is majestic—particularly the reading room, which has been called "the setting of a bibliophile's dream," and "the most beautiful room in Baltimore." The library was a gift from entrepreneur George Peabody to the people of Baltimore for their kindness and hospitality, and remains free and open to the public as part of the Sheridan Libraries Special Collections at Johns Hopkins University. In the reading room, one can find the library's collection of more than 300,000 volumes housed in five tiers of ornamental cast-iron balconies that stretch from the marble floor to skylights 61 feet above. There too, one could find John Dos Passos. Bald and bespectacled, Dos Passos hunched over his desk researching American culture and writing his own works. Often confused for a librarian, he helped library visitors locate books in the card catalog, understand antiquated text, and complete research papers. Although Dos Passos never wrote a book set in Baltimore, the city provided the author with more than just rooms in which to work. Baltimore helped pique Dos Passos' literary interest. The author recalled as a boy, "I would hide in the shadows so that I wouldn't be sent off to bed. 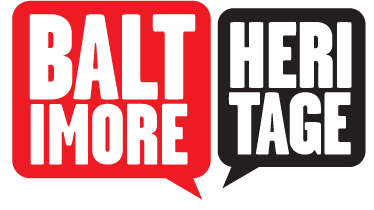 I'd listen till my ears would burst" to stories of old storytellers and watermen, stories in which Baltimore "was the center." Shortly before his death, he described Baltimore as a city that "imbues the inhabitants with a certain dignity" where "neighborhoods had a special flavor." Amelia Grabowski, “John Dos Passos at the Peabody Library,” Explore Baltimore Heritage, accessed April 23, 2019, https://explore.baltimoreheritage.org/items/show/118. Dos Passos, John. John Dos Passos, The Art of Fiction, No. 44. By David Sanders. The Paris Review, 2012. "History." The George Peabody Library. 2005. O'Grady, Tom. "The Fire Inside." The Dos Passos Review. 1.2. Shivers, Frank R., Jr. Maryland Wits and Baltimore Bards. Baltimore: Johns Hopkins University Press, 1985.